Turkey’s Parliament has approved two constitutional amendments giving more powers to the president, who will now be able to sponsor new legislation and appoint the cabinet, local media report. The changes come at the expense of MPs’ rights to oversee the government. MPs adopted three more items from the 18-article amendment bill during a heated vote on Thursday and early Friday, state-run Anadolu news agency reported. The package of amendments to the country’s constitution is meant to advance President Recep Tayyip Erdogan’s desire for ‘strong leadership,’ according to the local media. Article 8 has been particularly criticized by the opposition, as it empowers Erdogan to represent Turkey as “head of state,” according to NTV broadcaster. With the proposed changes, the president will be able to appoint and dismiss cabinet ministers, public officials, and the president’s staff. He will also have the authority to sponsor new legislation and submit it to the Parliament for review, Hurryiet said. The Parliament, for its part, will lose a sizeable portion of its powers, according to Hurriyet. According to Article 6, MPs will execute their authority over the government only through written requests for information, parliamentary inquiries, and “general meetings” to discuss issues relating to government’s actions, NTV reported. The parliament will no longer be able to issue motions of no confidence either. This particular article, which largely strips the Parliament of its oversight authority, was approved by 343 of 550 lawmakers. MPs have also approved Article 7, which sets out requirements for presidential candidates, stipulating that they must be at least 40 years old, hold a university degree, and be Turkish citizens. This article cancels the current provision that bans the president from having official connections to a political party, which is meant to promote division of power and maintain checks and balances. “This is a reduction of the state to a political party. It seems you want a party state,” Deniz Baykal, an MP from the center-left Republican People’s Party (CHP), told Hurriyet. 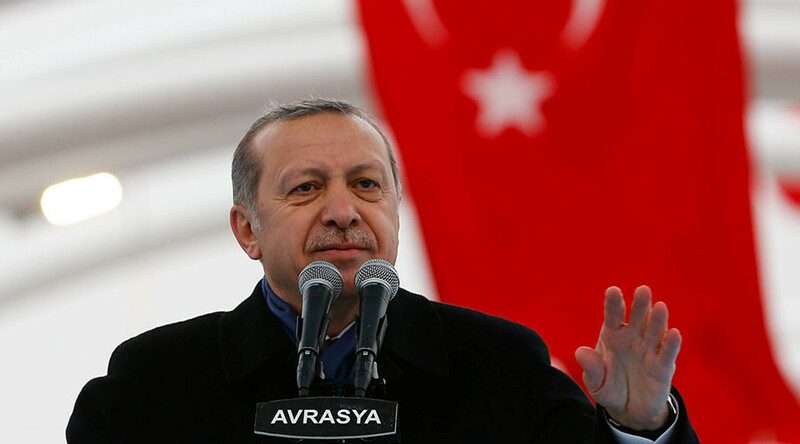 Erdogan said on Friday that he does not rule out calling early elections if MPs fail to introduce a full presidential system, Reuters reported. The Turkish strongman added that he hopes talks on constitutional reform will be finalized this week. Adopting the new amendments did not go as smoothly as expected, however. 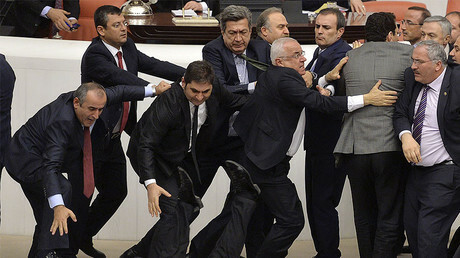 An all-out brawl erupted in the Turkish Parliament on Wednesday when MPs from the ruling Justice and Development Party (AKP) began to openly cast their votes in what was supposed to be a secret ballot on the third, fourth, and fifth articles of the bill. When hundreds of people gathered outside the parliament building earlier in January to oppose the amendments, the Parliament’s security detail pushed protesters away from the gates and police then fired tear gas and deployed water cannon to disperse the crowd. The reforms introduced by the ruling AK Party and the opposition Nationalist Movement Party (MHP) on December 30 bring Turkey closer to an executive presidential system similar to that of France or the United States. Yet, the measures still need to pass through two more rounds of voting before being put to a nationwide referendum.